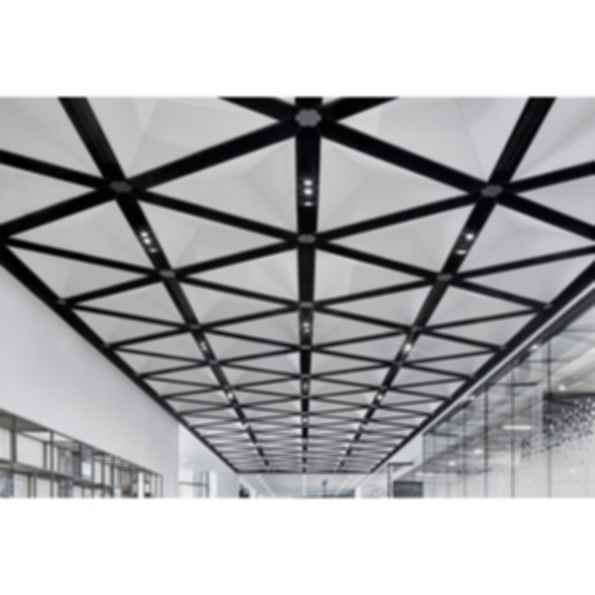 TriSoft® ceiling system makes it easy to add faceted dimensionality and quiet elegance to interiors. Its triangular faceted pyramid faces are composed of our Soft Sound® acoustical material (100% PET plastic with up to 60% recycled content) with a metal substructure. Mix and match TriSoft's® available modules and nodes as building blocks to build faceted straight field layouts scalable to any size space. With a variety of color options, and specially engineered attachment brackets, TriSoft® is designed for maximum impact, flexibility, convenience, and acoustic performance.